With the highly anticipated update to Mavericks 10.9.2, users gained the ability to block contacts in FaceTime and iMessage. This has been a long-awaited addition, since iOS 7 received this feature five months ago. 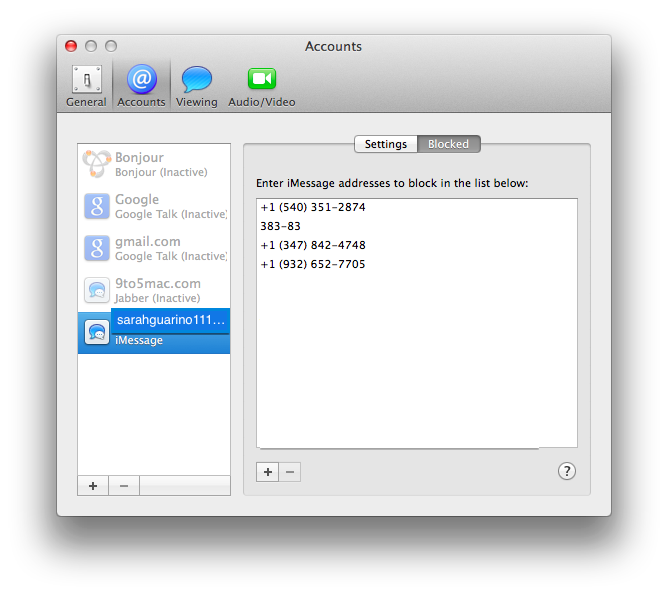 If you previously blocked people in iOS 7, the block list syncs over from your iOS devices to your Mac through iCloud. Make sure Documents and Data is turned on in order for that to occur. To get started, go into Messages or FaceTime and open the app’s Preferences. To get to preferences you can press command and comma at the same time, or click on Messages/FaceTime from the menu bar and then select Preferences. When you open Preferences in Messages, click on the Accounts tab. Then select your iMessage account from the list. With FaceTime no new window appears. Instead, the preferences appear where the contact list usually is in the app. From here, press the Blocked button. In Messages it is in the center next to the Settings button. In FaceTime the Blocked button is underneath the email address you use as your incoming address. To block someone you just press the + button. In Messages it is located on the lower left hand side below the list of numbers you have blocked. In FaceTime the + button is located in the upper right hand corner. It instantly brings you to your list of contacts and you can select someone from your list of contacts you want to block. In the example below, I do not want to block Mark Gurman, so I’m going to unblock him. The steps to unblock a contact are a little different than the directions to block someone. In Messages, you select his name so it is highlighted in blue, and then either press the – button in the lower left hand corner or the delete key on the keyboard. In FaceTime, you click on his name and then press the Unblock button. There is a limitation to blocking someone from the Mac. For Messages, the person you want to block must be in your contacts, unlike in iOS 7 where the person does not have to be in your contact list. When you get spam texts there is no easy way to block the person. Right clicking on the Senders name does not give you the option to block them. Instead there are options to add the address to your contacts or compose a new email. Theoretically you could add the spammer to a contact that would contain a list of people who are spammers. Since it is in your contacts you can then block it, but I don’t really want a list of spam in my contact list. Hopefully in a future update, Apple will fix this issue with blocking people from Messages. On the other hand with FaceTime, Apple does get it right. If you get a FaceTime call from an unknown person or spammer, you can easily block it. To do so, tap on Recents, then tap on the white triangle next to the time the call was placed. Here you’ll see options to place a FaceTime or FaceTime Audio call, block this caller, or add the caller to your contacts. To block the caller select Block this Caller.